The cult hit comedy returns with new stories and a bonus classic in the back of the issue in PUNKS: THE COMIC #1. From Eisner and Harvey award nominees Joshua Hale Fialkov (The Bunker, The Ultimates) and Kody Chamberlain (SWEETS, The Ride) comes the latest dose of irreverent, fun-loving hilarity that fans have been waiting for. Dog, Skull, Fist, and Abe Lincoln live in a house, beat the #%?! out of each other, and frequently humiliate themselves. There is bleeding and sadness; Morrissey would likely approve. "Returning to both the world of Punks and Image is like a warm, slimey sock,” said Fialkov, before pausing to rethink the comparison. “No. That's a terrible analogy. It's like a pungent pair of goiters. No. This isn't going well. Um... Getting to make newPunks for a whole new audience is a dream come true. And not one of those weird dreams with too much massaging." 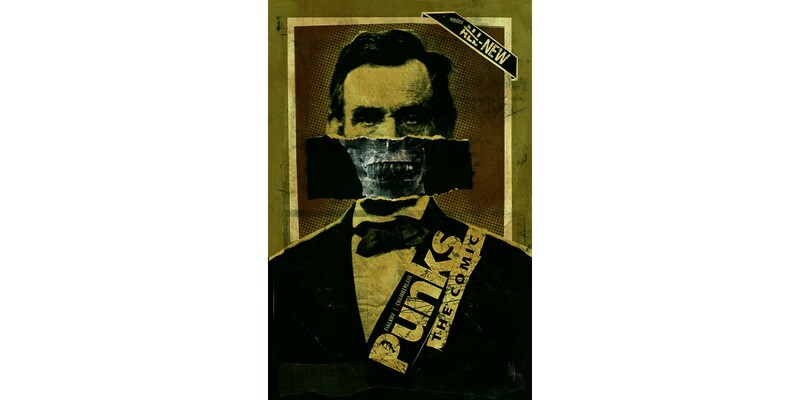 PUNKS: THE COMIC #1 arrives in stores on 10/8, available for $3.99. It can be pre-ordered with Diamond Code AUG140539. A variant cover by Eisner award-winning artist Rob Guillory will also be available for pre-order with Diamond Code AUG140540.